Soft and chewy focaccia bread, loaded with fresh chopped rosemary and lots of good quality extra virgin olive oil! Use this bread for sandwiches, or just dip it in some balsamic vinegar for the perfect appetizer. In a bowl of a stand mixer fitted with a dough hook combine the water and yeast. Stir to dissolve. Add 1 cup of the wheat flour and ½ cup of the white flour. Mix on low speed for about 2-3 minutes then cover with a towel and let rise for 30 minutes. Prepare two 6-inch skillets by rubbing generously with olive oil. Fold in the olive oil, salt and 2 Tbsp of the rosemary to the dough. Add the remaining 1 cup of wheat dough and ¾ cup of the white flour. Mix on low speed for 3-4 minutes. Add more flour if the dough is still very sticky but it should be soft and not too stiff and wrapped around the dough hook. Dust your work surface with some flour and turn the dough onto it. Gently knead the dough into a ball shape and cut it in half. Knead each piece of dough into a ball and place in the prepared skillets and press down on them to fill the space. Cover with a towel and let rise for about 30 minutes. Preheat the oven to 400°F while dough is rising. Using a pastry brush, gently glaze each loaf with olive oil and then sprinkle the remaining rosemary over the top. Slice each loaf in a diagonal pattern with a sharp serrated knife and sprinkle with some sea salt flakes. Bake in the oven for about 25 minutes and the bread is golden brown. Once the bread comes out of the oven, brush with more olive oil and let cool. 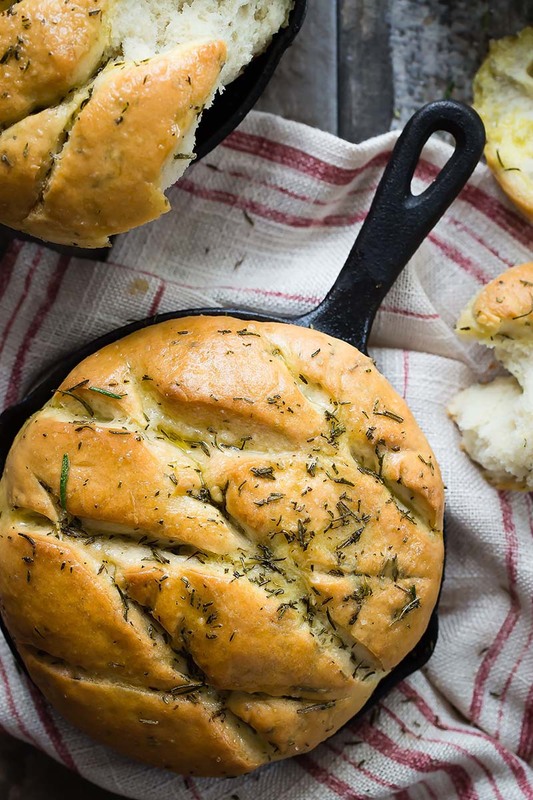 Can ypu make one big loaf in a 12″ skillet? Or would 6″ cake pans work? I don’t own any 6″ skillets. I don’t see why the 12-inch skillet shouldn’t work. You may need to adjust the bake time, so keep an eye on your focaccia.